I like trying different kinds of muffins since they make a great morning snack, especially when I am so busy in the morning. 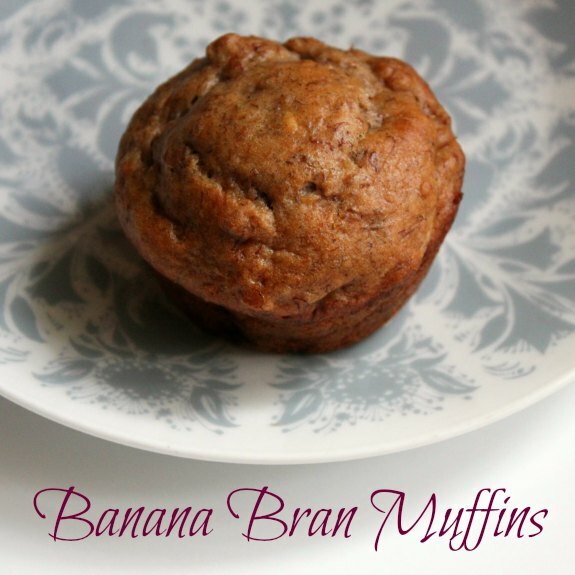 These are tasty little muffins that also have a lot of fiber in them! Preheat oven to 400 F. Grease or line a dozen muffin cups. Combine cereal, banana, milk, egg, and oil in a bowl, and mix well. Let stand approx. 5 minutes, then stir to break up cereal. Combine flour, sugar, baking powder, baking soda, and nutmeg, in a separate bowl. Add cereal mixture all once to flour mixture, stirring just until moistened. Bake 20-25 minutes or until toothpick comes out clean. Recipe is from the back of a Price Chopper High Fiber Bran Flakes cereal box.